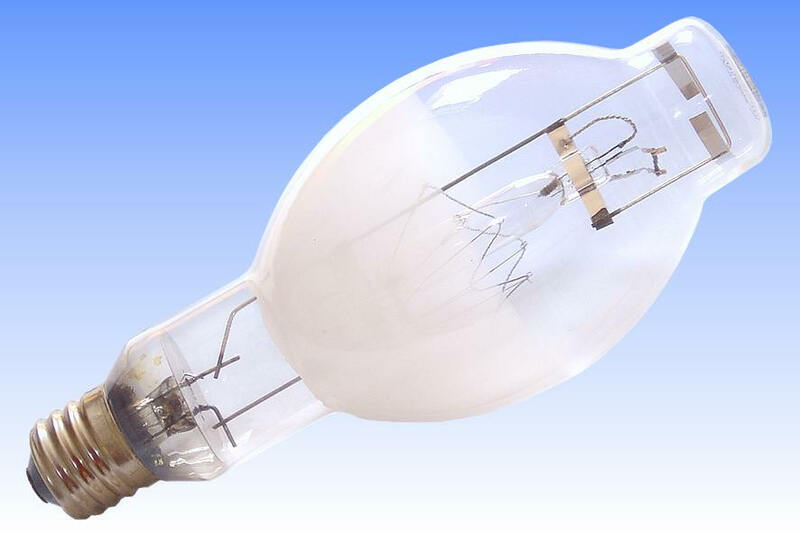 Self-ballasted mercury lamps made by American firm Duro-Test marked a significant departure from the traditional design principles that had been applied to lamps of this type. 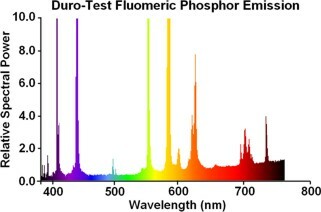 The filament in early lamps was employed to improve the colour properties of the mercury discharge. 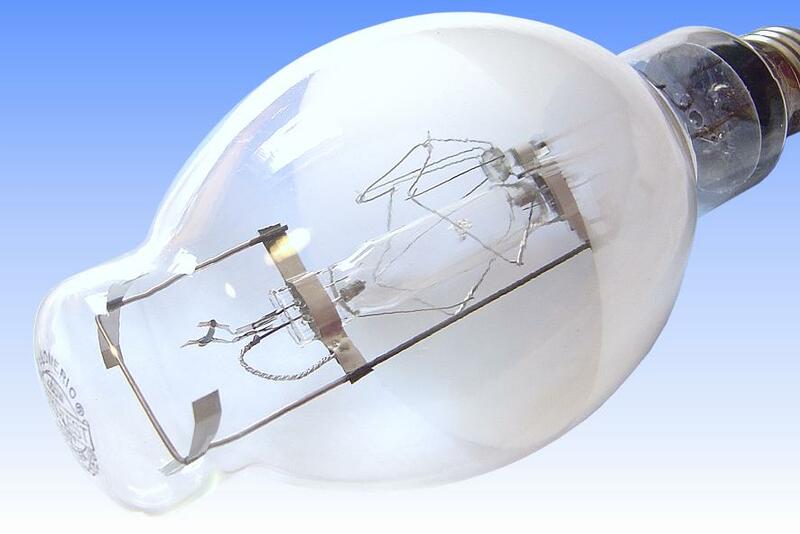 However the high power dissipation in the filament made these lamps rather inefficient. A high filament temperature was also required, leading to a short life of around 3000 hours. 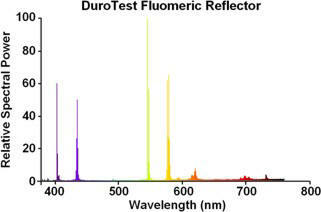 Duro-Test took a different approach, and instead optimised its lamps for the best luminous efficacy, with only a modest degree of colour correction. The filament temperature was lowered to reduce its dissipated energy, and to permit an increase in life. The marketing strategy behind these lamps was primarily to reduce system cost by eliminating the ballast, while offering slightly improved colour. 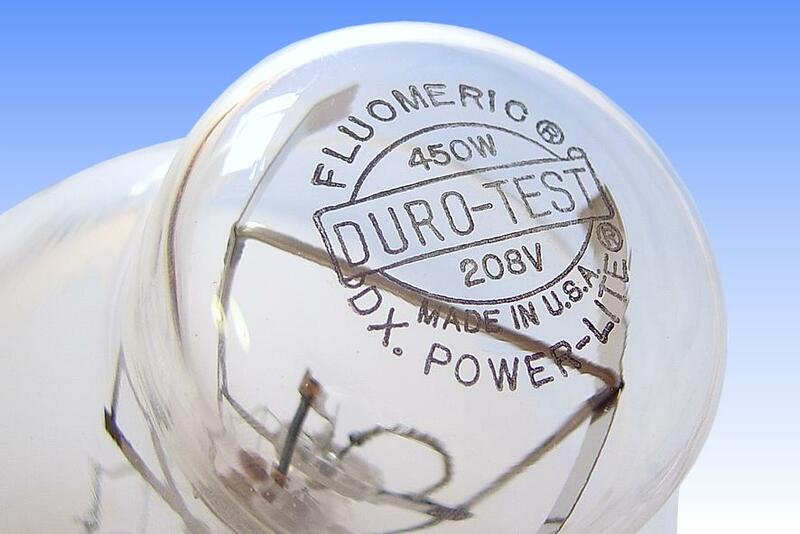 The first 'Fluomeric' model was the 750W in R-57 bulb, launched in 1956. Later in 1959, this 450W version and the larger 1750W were added. 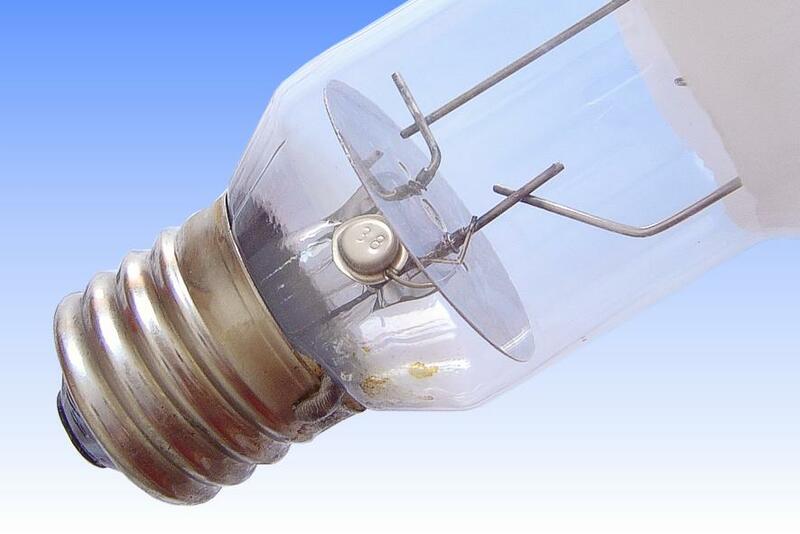 The arc tube is essentially the same as a 250W mercury lamp, and is ballasted by a 200W filament. The net colour temperature is high at 4400K and the colour rendering low at 30. Performance may be contrasted with standard 500W self-ballasted lamps, which dissipate about 150W in the discharge and 350W in the filament, and show 3500K colour temperature with Ra 65, but lower efficacy. The bulb is half-coated with a very thin layer of yttrium vanadate, to direct more light downwards while providing some colour correction. Note also the early arc tube design with hand-shrunk regions above the seals. Gettering in this lamp is performed by a zirconium-aluminium paint on the support frame, as well as red phosphors applied to the filament. Factory: North Bergen, NJ U.S.A.
References: 1) "Self Ballasted Vapor Lamps", H.S. Strauss & W.E. Thouret, Illumination Engineering, February 1959, pp96 - 106.